The OLSR is available as a patch for ns2 for various versions. There is a new version UM-OLSR patch in the given link below. The zip file also has a patch file that can be patched for various ns2 versions. if you encounter any errors, go for manual patching. Once all the files were copied to their location. 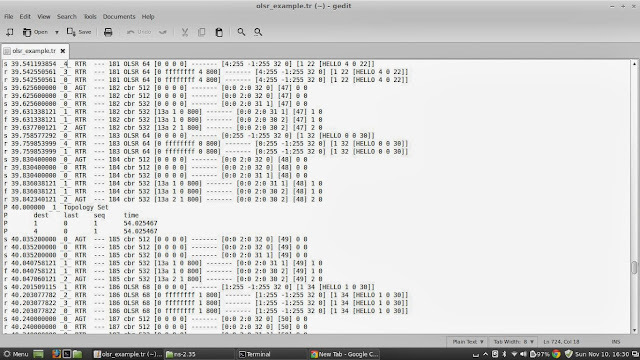 Open the terminal and go to the ~ns-2.35/ folder and execute the commands one by one. set opt(sc) "" ;# node movement file. puts "Seeding Random number generator with $opt(seed)\n"
$ns_ at $opt(cbr-start) "$cbr start"
$ns_ at 10.0 "[$node_(0) agent 255] print_rtable"
$ns_ at 15.0 "[$node_(0) agent 255] print_linkset"
$ns_ at 20.0 "[$node_(0) agent 255] print_nbset"
$ns_ at 25.0 "[$node_(0) agent 255] print_nb2hopset"
$ns_ at 30.0 "[$node_(0) agent 255] print_mprset"
$ns_ at 35.0 "[$node_(0) agent 255] print_mprselset"
$ns_ at 40.0 "[$node_(0) agent 255] print_topologyset"
puts "*** NOTE: no connection pattern specified." puts "*** NOTE: no scenario file specified." $ns_ at $opt(stop) "puts \"NS EXITING...\" ; $ns_ halt"
Here is the sample output for the node 1 with various printing. This shows the successful installation of OLSR in ns-2.35. Comment on if you have any other queries. Sir I tired you method but it showing me problem on ns 2.34 and ns 2.35.